The Agenda proposes a framework of high-level issues that countries should consider in their own domestic policy discussions and aims to guide staff from the two institutions in their own work and dialogue with national authorities. The 12 elements (see table) were distilled from members’ own experiences and cover topics relating broadly to enabling fintech; ensuring financial sector resilience; addressing risks; and promoting international cooperation. “There are an estimated 1.7 billion adults in the world without access to financial services,” said IMF Managing Director Christine Lagarde. “Fintech can have a major social and economic impact for them and across the membership in general. All countries are trying to reap these benefits, while also mitigating the risks. We need greater international cooperation to achieve that, and to make sure the fintech revolution benefits the many and not just the few. This Agenda provides a useful framework for countries to assess their policy options and adapt them to their own circumstances and priorities. “The Bali Fintech Agenda provides a framework to support the Sustainable Development Goals, particularly in low-income countries, where access to financial services is low,” World Bank Group President Jim Yong Kim said. 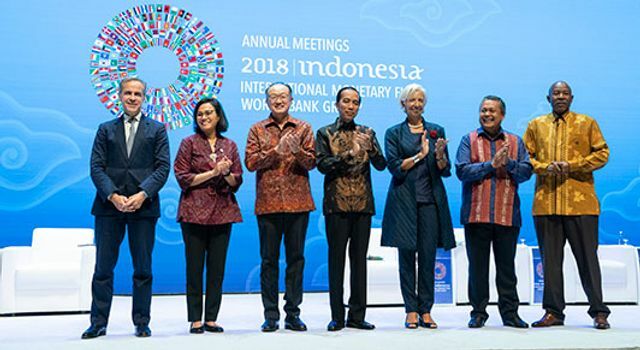 “Countries are demanding deeper access to financial markets, and the World Bank Group will focus on delivering fintech solutions that enhance financial services, mitigate risks, and achieve stable, inclusive economic growth.” Mrs. Lagarde and Dr. Kim presented the Agenda in a panel discussion today during the Annual Meetings in Bali. They were joined by Sri Mulyani Indrawati, Minister of Finance of Indonesia; Lesetja Kganyago, Governor of the South African Reserve Bank; and Mark Carney, Governor of the Bank of England and Chair of the Financial Stability Board. With their near universal membership, the Fund and the Bank, are well positioned to gather information from all countries and to reflect on their respective needs and objectives at various levels of economic and technological development. They both also offer a forum for sharing the experience of countries that are not members of international standard-setting bodies on issues such as combating money laundering and terrorism financing, market integrity, and consumer protection. The Financial Stability Board and several other international standard-setters have been reviewing the implications of fintech developments and have indicated regulation and supervision priorities. The IMF and World Bank will start developing specific work programs on fintech, as the nature and scope of their members’ needs become clearer, in response to the Bali Fintech Agenda. The IMF’s initial focus will be on the implications for national and global monetary and financial stability; and the evolution of the International Monetary System and global financial safety net. In response to the Bali Fintech Agenda, the World Bank will focus on using fintech to deepen financial markets, enhance responsible access to financial services, and improve cross-border payments and remittance transfer systems. The Bank will draw on the International Finance Corporation’s growing experience in this area. The Agenda contributes to building the foundations of the digital economy that is a key pillar in the World Bank Group’s larger disruptive technologies engagement. Executive Board Statement IMF Executive Directors welcomed the opportunity to consider the Bali Fintech Agenda, and praised the excellent ongoing cooperation between the Fund and World Bank staff in this area, along with other international bodies. Directors broadly endorsed the Agenda as a framework for the consideration of high level fintech issues by individual country members, including in their own domestic policy discussions. They recognized that the Agenda does not represent a work program for the Fund and World Bank Group. Directors concurred that the elements of the Agenda have broad relevance to all member countries and that national authorities should tailor the application of these elements in light of their specific circumstances. This would help reap the benefits of fintech while remaining vigilant about the potential risks and enhancing preparedness to address them. Directors also noted that the elements of the Agenda could apply to both conventional and Islamic financial instruments and products. While recognizing the rapid pace of fintech development and its uncertain impact, Directors concurred that fintech offers wide ranging possibilities in deepening and enhancing the efficiencies of financial systems, broadening access to financial services—especially in low income countries and for underserved populations—and supporting broader economic development and inclusive growth. They acknowledged the potential risks posed by rapid technological changes to financial systems and individual users and stressed the need for adequate preparation and cross agency coordination by national authorities, including through strengthening of institutional capacity, building up knowledge, improving communication with stakeholders, and expanding consumer education. Directors called on the Fund to stand ready to provide technical assistance, particularly for countries with significant capacity gaps, while facilitating information sharing. Directors generally considered the elements of the Agenda as broadly balanced in pointing out opportunities while acknowledging potential risks of fintech. They agreed on the need to strike the right balance between enabling financial innovation and reinforcing competition and the commitment to open, free and contestable markets on the one hand and addressing challenges to financial integrity, consumer protection, and financial stability on the other. Directors broadly agreed on the need to augment regulatory and legal frameworks to support the sound development of fintech services and safeguard financial systems. They called for close international cooperation and coordination to address regulatory gaps and prevent the potential risk of a race to the bottom in regulatory compliance, including Anti-Money Laundering/Countering the Financing of Terrorism compliance and the spread of global systemic risks. Directors called on staff to work closely with the standard setting bodies (SSBs) and relevant international bodies, while avoiding duplication and overlap. They encouraged staff to continuously monitor and analyze fintech developments and consider their implications within the Fund’s mandate, focusing on analytical and country work with respect to cross border capital flows, financial integrity, national and global monetary and financial stability, and the evolution of the International Monetary System and global financial safety net. ANNEX The Bali Fintech Agenda I. Embrace the Promise of Fintech with its far-reaching social and economic impact, particularly in low-income countries, small states, and for the underserved, and prepare to capture its possible wide-ranging benefits, including: increasing access to financial services and financial inclusion; deepening financial markets; and improving cross-border payments and remittance transfer systems. Reaping these benefits requires preparation, strengthening of institutional capacity, expanding outreach to stakeholders, and adopting a cross-agency approach involving relevant ministries and agencies. II. Enable New Technologies to Enhance Financial Service Provision by facilitating foundational infrastructures, fostering their open and affordable access, and ensuring a conducive policy environment. Foundational infrastructures include telecommunications, along with digital and financial infrastructures (such as broadband internet, mobile data services, data repositories, and payment and settlement services). The infrastructures should enable efficient data collection, processing, and transmission, which are central in fintech advances. III. Reinforce Competition and Commitment to Open, Free, and Contestable Markets to ensure a level playing field and to promote innovation, consumer choice, and access to high-quality financial services. The successful and large-scale adoption of technology would be facilitated by an enabling policy framework regardless of the market participant, underlying technology, or method by which the service is provided. Policymakers should address the risks of market concentration, and should foster standardization, interoperability, and fair-and-transparent access to key infrastructures. IV. Foster Fintech to Promote Financial Inclusion and Develop Financial Markets by overcoming challenges related to reach, customer information, and commercial viability, and by improving infrastructure. The evolving digital economy together with effective supervision are essential in overcoming long-standing barriers to financial inclusion across a broad range of financial services and in enabling developing countries to leverage promising new pathways for economic and financial development to support growth and alleviate poverty. Examples include expanding access to finance while reducing costs, providing new ways to raise funding, enabling new information services to assess risks, and spurring new businesses. To achieve these goals, fintech issues should be part of a national inclusion and financial and digital literacy strategies, while fostering knowledge-sharing between public- and private-sector players, civil society, and other stakeholders. V. Monitor Developments Closely to Deepen Understanding of Evolving Financial Systems to support the formulation of policies that foster the benefits of fintech and mitigate potential risks. The rapid pace of fintech will necessitate improvements and possible extensions in the reach of monitoring frameworks to support public-policy goals and to avoid disruptions to the financial system. Information-sharing and exchange would support improved monitoring. Achieving these objectives brings out the importance of continuous monitoring—including by maintaining an ongoing dialogue with the industry, both innovators and incumbents—to identify emerging opportunities and risks, and to facilitate the timely formation of policy responses. VI. Adapt Regulatory Framework and Supervisory Practices for Orderly Development and Stability of the Financial System and facilitate the safe entry of new products, activities, and intermediaries; sustain trust and confidence; and respond to risks. Many fintech risks might be addressed by existing regulatory frameworks. However, new issues may arise from new firms, products, and activities that lie outside the current regulatory perimeter. This may require the modification and adaptation of regulatory frameworks to contain risks of arbitrage, while recognizing that regulation should remain proportionate to the risks. Holistic policy responses may be needed at the national level, building on guidance provided by standard-setting bodies. VII. Safeguard the Integrity of Financial Systems by identifying, understanding, assessing, and mitigating the risks of criminal misuse of fintech, and by using technologies that strengthen compliance with anti-money laundering and combating the financing of terrorism (AML/CFT) measures. While fintech innovation generally supports legitimate goals, some innovations may enable users to evade current controls for criminal ends, thus posing a threat to financial integrity. Country responses have varied considerably; but, in all cases, it is important to strengthen AML/CFT compliance and monitoring, including by using technology (Regtech and Suptech solutions) to support regulatory compliance and supervision. VIII. Modernize Legal Frameworks to Provide an Enabling Legal Landscape with greater legal clarity and certainty regarding key aspects of fintech activities. Sound legal frameworks support trust and reliability in financial products and services. This is undermined, however, where legal frameworks fail to keep pace with fintech innovation and evolving global financial markets. An enabling legal framework can be fashioned by having clear and predictable legal rules that accommodate technological change, tailored to national circumstances, particularly in areas such as contracts, data ownership, insolvency, resolution, and payments. IX. Ensure the Stability of Domestic Monetary and Financial Systems by considering the implications of fintech innovations to central banking services and market structure, while: safeguarding financial stability; expanding, if needed, safety nets; and ensuring effective monetary policy transmission. Fintech could transform the financial markets through which monetary policy actions are transmitted and could challenge the conduct of monetary policy as well as redefine central banks’ role as lenders of last resort. On the other hand, fintech could help central banks improve their services, including potentially issuing digital currency, and expanding access to and improving the resilience of payments services. X. Develop Robust Financial and Data Infrastructure to Sustain Fintech Benefits that are resilient to disruptions––including from cyber-attacks––and that support trust and confidence in the financial system by protecting the integrity of data and financial services. Developing such robust infrastructure raises a broad spectrum of issues that are relevant not only to the financial sector but also to the digital economy at large, including data ownership, protection, and privacy, cybersecurity, operational and concentration risks, and consumer protection. XI. Encourage International Cooperation and Information-Sharing across the global regulatory community to share knowledge, experience, and best practices to support an effective regulatory framework. As new technologies increasingly operate across borders, international cooperation is essential to ensure effective policy responses to foster opportunities and to limit risks that could arise from divergence in regulatory frameworks. Sharing experiences and best practices with the private sector and with the public at large would help catalyze discussion on the most effective regulatory response, considering country circumstances, and to build a global consensus. The IMF and World Bank can help in facilitating the global dialogue and information-sharing. XII. Enhance Collective Surveillance of the International Monetary and Financial System and the adaptation and development of policies to support inclusive global growth, poverty alleviation, and international financial stability in an environment of rapid change. Fintech is blurring financial boundaries—both institutionally and geographically—potentially amplifying interconnectedness, spillovers, and capital flow volatility. These developments could lead to increased multipolarity and interconnectedness of the global financial system, potentially affecting the balance of risks for global financial stability. The IMF and World Bank could help in improving collective surveillance and assist member countries via capacity building, in collaboration with other international bodies.